I have a secret … I don’t have a juicer and I still make celery juice almost every day! It can be done, quite easily actually, and I find I get more yield in juice, and it’s quick to clean up. So, here’s how to juice without a blender! Chop up celery and prepare to rinse. You can rinse it before hand too. Add to blender with some water. Yes, I add a little bit of water. Some people don’t, and I do, and it works for me! I usually add about 2-4 oz water. Then blend until smooth. 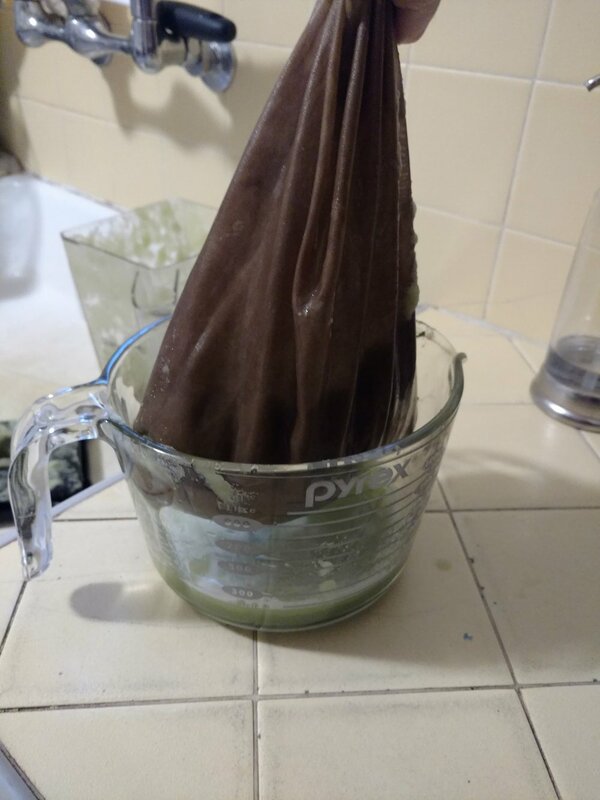 Squeeze the bag until the liquid runs out and only the pulp remains. It’s like squeezing an almost empty tube of toothpaste, or yes, like milking the udder of a mammal. But I don’t like that comparison because we are not exploiting animals here, we’re making a health tonic! Rinse thoroughly, or you can wash with your favorite produce wash.
After the celery is completely liquified, line a large container with a nut milk bag, and pour the celery juice in to the bag. I use a mesh one, and it’s really easy to clean. The cloth bags can get gunky and slimy. Also, this bag is stained because we used to use it to make kombucha, so it is NOT stained from the celery juice, haha! Voila, you have your celery juice! I clean out the nut milk bag and blender right away. The entire process takes less than 5 minutes. Sometimes I just drink the juice straight out of the measuring glass, or if I’m feeling fancy or have time, I’ll put in in another glass. How much celery makes 16 oz of juice? I have found this really varies. Sometimes I can get 16 oz out of a large head of celery, and sometimes I need 1.5 heads or even 2 whole heads of celery. The small, skinny stalks and small heads of celery will obviously produce less juice. Where do you buy your celery? I go back and forth between Sprouts, Trader Joes and Costco, and sometimes even Whole Foods. It seems expensive at Whole Foods, but sometimes I only need one head or even less than one head of celery and I can get up to 20 oz of juice from the celery at Whole Foods. Sprouts will often have larger heads of celery as well, and a better price, so sometimes I will get a bunch at Sprouts. Mostly, it depends on where I am geographically and on what day I need to buy more celery! You can expect this to cost about $50-75/month, which is why I do not make it every day. I make it about 3x a week. Try not to think of it as just juice though, it is a healing tonic and can do miraculous things for the body. It’s actually really good! It’s mild and salty, yum! Try to leave out the leaves because they can add a bitterness to it. My celery juice turned out brown, should I drink it? No, this is old celery or not as potent of celery, so please don’t drink it. It’ll be gross. To get the brightest green celery juice, use the brightest green celery! If the celery is more whitish, the juice will have a browner color to it. So go for as green as you can find! Can I just blend celery and drink it, why make juice? This can be explained much better by Medical Medium, so I’ll link his info below. Suffice it to say, the juice goes down a lot easier and it is 100% bioavailable. The pulp will act like a plug, stopping the body from being able to absorb all the juice goodness. Does your husband drink it? There is even more info here on Medical Medium’s website, where he does a very comprehensive Celery Juice 101, so check it out!